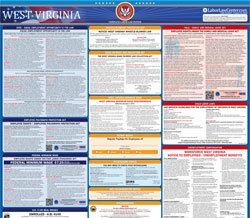 The WV Minimum Wage and Maximum Hours Law is a minimum wage law poster by the West Virginia Division of Labor . This poster is mandatory for some employers, including employers with 6 or more employees. This poster must be posted in a conspicuous place by all employers that have at least 6 employees so that all employees can see it. This poster describes what the minimum wage is for both tipped and untipped employees and when employers must pay a Minimum Wage Credit to tipped employees. It appears you don't have a PDF plugin for this browser. Please see the link below to download west-virginia-minimum-wage-poster-012018.pdf. • Beginning January 1, 2016 , employers must pay employees at least $8.75 per hour. training wage of at least $6.40 per hour for the first 90 days of employment. wage rate of at least $2.62 per hour. rate equal at least the required minimum wage rate and must keep accurate records of employees’ tips.